If you have been reading my blog for a while, you have probably figured out that I love pancakes. But did you know that one of my top 5 favorite foods is actually sweet potatoes? I haven’t posted many recipes featuring them, mostly because they do not exist in Ukraine (and that’s where I was cooking and recipe-ing from September 2010 to November 2012). Now that I’m back in sweet potato land, however, they feature regularly — weekly, no joke — in my pans of roasted root vegetables. Sweet potatoes are delicious baked whole in the oven, split open and juiced up with some butter, salt, and pepper. They also feature wonderfully in these pancakes. (Uh oh, back to pancakes again…) But I’m really here to tell you that I’ve discovered another great use for sweet potatoes: biscuits! I recently learned how easy it is to make biscuits — they’re great alongside beef stew or with whipped goat cheese and tomatoes. 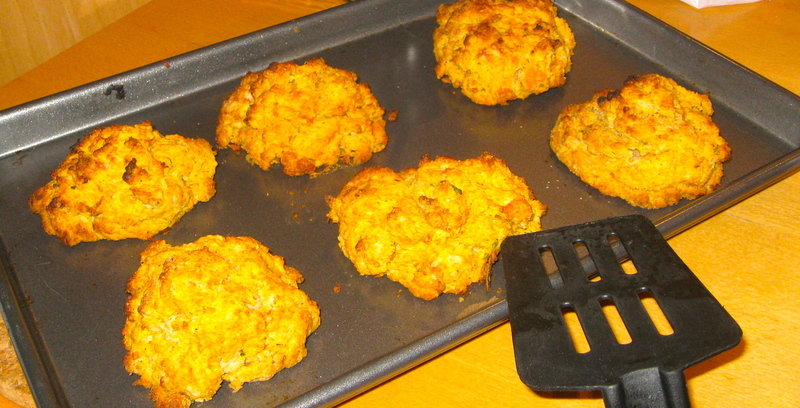 Thanks to spoon fork bacon, I can now throw together a variation on simple biscuits that includes sweet potatoes. We enjoyed these sweet potato rosemary biscuits with reheated vegetarian chili that we made 7 liters of a couple weeks ago (there was too much to finish…after 3 days we had to freeze the rest before the beans knocked us both out). F had barely taken one bite of his biscuit before saying, “You have to make these again.” Yes, they were that good. Super moist (from the potato), sweet and salty, slightly piney from the rosemary…They were so good I didn’t even dip mine in my chili because I wanted to enjoy the flavors all by themselves. The biscuits are also excellent toasted with butter or spread with a bit of cream cheese. Peel and dice the sweet potato, then boil it until soft (15-20 min). Drain and then mash the potato. Whisk together the dry ingredients, then cut in the butter with a pastry cutter or your fingers until it is evenly distributed in pea-sized pieces. 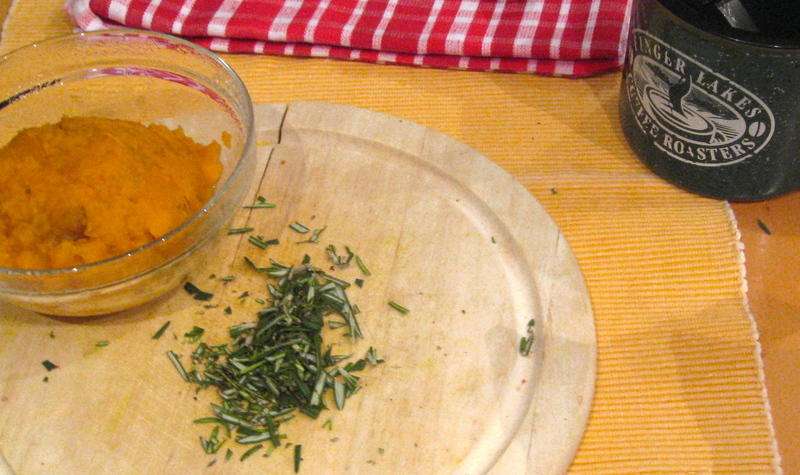 Fold the sweet potato, rosemary, and buttermilk into the dry ingredient until just combined. Plop globs of dough onto a cookie sheet and bake for 15-20 minutes or until the biscuits look set and have just started to brown on top. Remove the tray from the oven and let the biscuits cool for a few minutes before serving. This entry was posted in food, health, Peace Corps, pictures, recipes and tagged biscuits, breakfast, brunch, pancakes, sweet potatoes on 02.03.2013 by taplatt.